Our friend, children's book author Eloise Greenfield, has a new Youtube video! She's performing "Nathaniel's Rap," a poem from her book, "In The Land Of Words" (Copyright 2004). 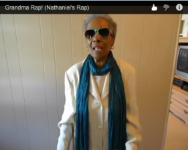 The Nathaniel's Rap video is listed as "Grandma's Rap," and both the music and video were produced by Eloise's grandson. Little Bear is the creative director of The Beauty of Picture Books Website & Blog.